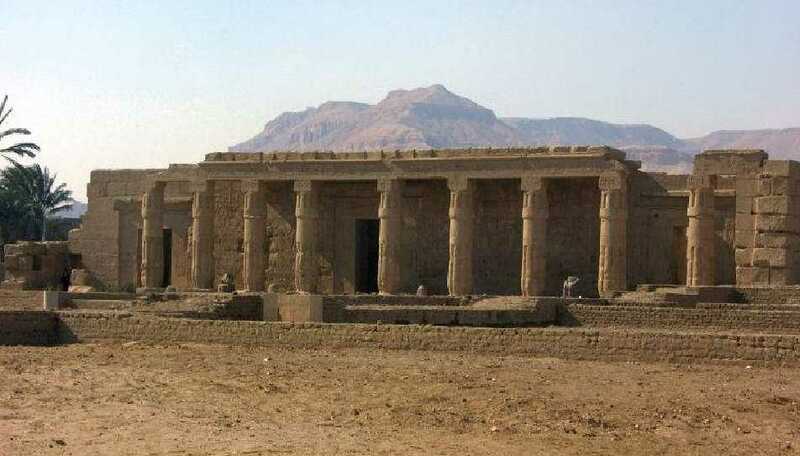 This temple was built by Seti I in reverent memory of his father, Ramses I, w ho ruled for little more than a year, and, of course, for his own cult. It was completed by his son, Ramses II. 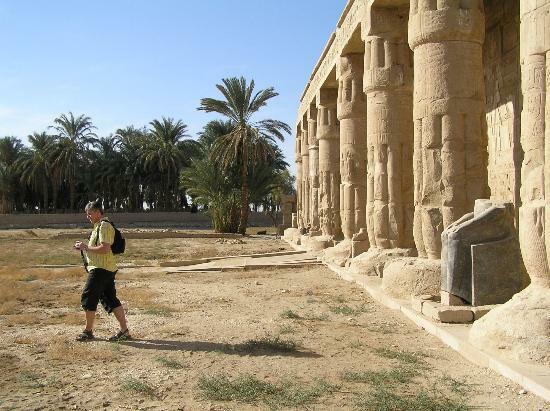 Only the rear part of the temple survives, but it contains some of the finest relief work in the Nile valley. Seti I started an art and architectural revival during his reign. He wished to return to the traditional canons of Egyptian art after the so-called Amarna period, and his two temples, at Kurna and Abydos (page 21), have delicate, classical reliefs. The first court was totally destroyed, and a row of columns are all that remain of the colonnade of the second court. To the left and right of the central doorway are figures of men and women alternately. Those to the south (a) have lotuses on their heads, representing Upper Egypt; the figures to the north have papyri, representing Lower Egypt. All bear flowers, cakes and caskets. 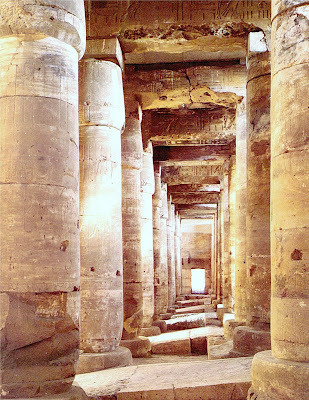 The Hypostyle Hall (A) is flanked by small chambers on each side. The walls between them have reliefs of Seti I and Ramses II with the various deities. At (b) and (c) Seti is nourished by Mut, wife of Amon-Ra, and Hathor, respectively. The fine-textured limestone of this temple was worked with flair and precision. The reliefs of the side chambers are beautifully carved. In (d) is a scene of the enthroned Seti between Amon-Ra and his consort Mut on one side, and Ptah and his consort Sekhmet, on the other. In (e) Seti makes offerings to Osiris; Isis, Hathor and Nephthys stand behind the throne. In (f) the enthroned, deified, Seti receives offerings from other gods; they include Wepwawat, the wolf-jackal of Abydos. In the Sanctuary (B) there are four simple square pillars and the base of the sacred barge. The reliefs show' Seti making offerings.